EDS Whole Teen Complete Package provides each student with 30 hours of classroom instruction, which includes all materials. We offer Monday thru Thursday classes and Sunday only classes. (Sunday classes are only held during the school year).. We provide free pick up and drop off for behind the wheel lessons for your convenience. Students will be able to choose from the following driving packages: The Whole Teen Course includes 6 hours of in car driving and 6 hours of in car observation; The Deluxe Teen Package includes 8 hours of in car lessons (no observation needed). Other students may still observe your teen. All of our programs meet state certification and high school graduation requirements. 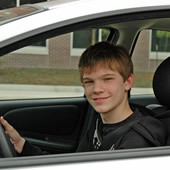 The Deluxe Teen Package includes 8 hours of in car lessons (no observation needed). Other students may still observe your teen.